When Anthony Crivello runs, he breathes. Deep breaths of the southern California air where he lives and works as a police officer in San Diego County. He breathes like any other runner training for the Los Angeles Marathon, just a few weeks away. What were once hard breaths at the beginning of his training now come easier as both his lungs contract, working in tandem with his heart. For most, it’s an unassuming background rhythm; the normal functions of a body performing as it should. For Anthony, however, each contraction of his lungs takes on a different meaning and a different purpose. He breathes for his son Andrew, in a way he never could. At first, they thought Andrew was going to be a girl. The first blood test in the fall of 2017 foretold that Anthony, 30, and his wife Kaitlyn, 28, would soon be having a daughter to complement their 2-year-old son Noah. At their 20-week ultrasound, they were surprised to find out that instead, they were having another boy. “I was shocked,” said Anthony, who had wanted another boy in the first place, although Kaitlyn wanted a girl. They barely had time to imagine their new family structure when the doctors called a week later and asked them to come back. There was something about the baby’s heart that needed a closer look. Although worried, neither Anthony nor Kaitlyn knew what to expect. They visited a prenatal specialist as the doctor suggested, and Kaitlyn had another ultrasound. When the doctor came in afterward, he delivered the news that threw them into immediate denial. Their son had hypoplastic left heart syndrome (HLHS), a congenital heart defect in which the left side of the heart is severely underdeveloped. Essentially, Andrew had half a heart. Congenital heart defects (CHDs) affect nearly 40,000 babies each year in the United States alone and are the most common cause of infant death due to birth defects. Beneath that umbrella resides a variety of defects with varying levels of severity and survival rates. While HLHS in infants is not inoperable, its full extent is often not known until the baby is actually born. While Andrew was in the womb, he was able to grow as any baby would since Kaitlyn supplied blood and nutrients to his body. 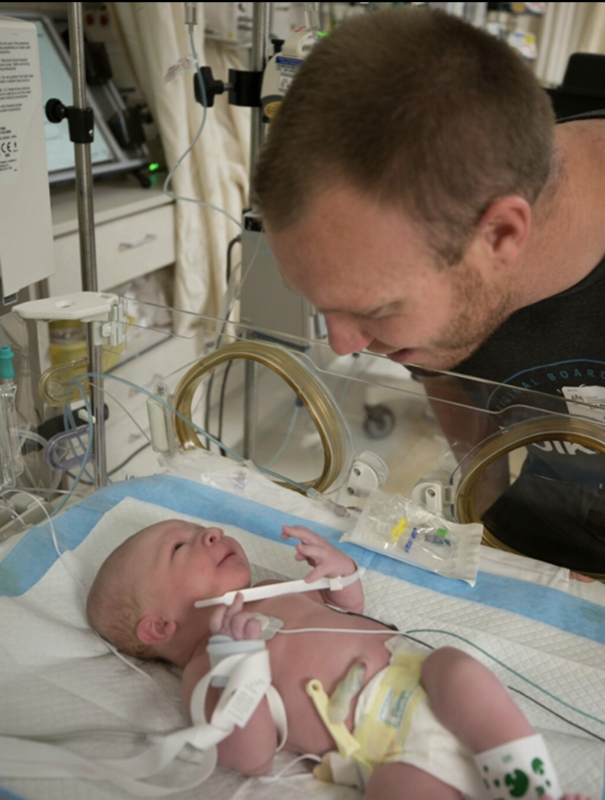 With each passing day leading to his birth, the inevitability weighed on Kaitlyn that his birth would mean having to let him into the world on his own, where his own heart and lungs would have to take over. At 39 weeks, on March 20, 2018, Kaitlyn was induced and the Crivellos suddenly had a 7 lb. 2 oz., red-haired baby boy. 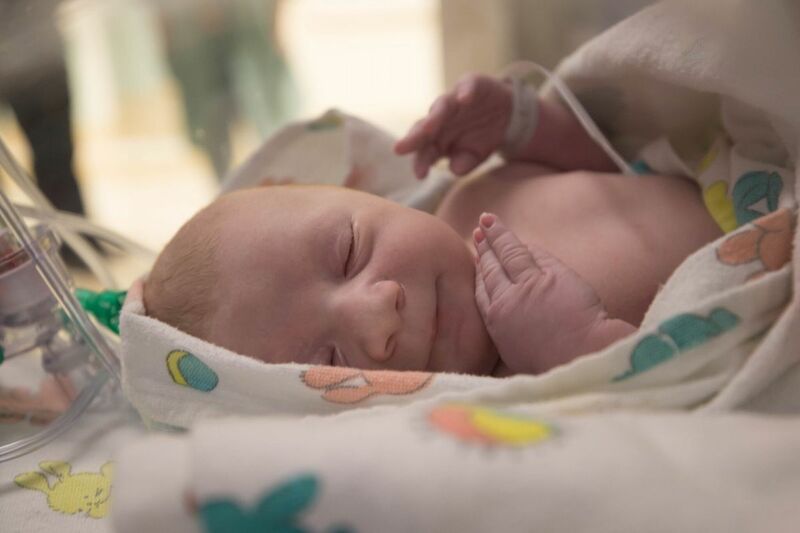 Right after he was born, the doctors at Kaiser Sunset put Andrew on his mother’s chest, and he started crying immediately— a good sign. To the family, it felt like a weight had been lifted. “When I got to hold him, I remember my mother-in-law saying ‘I haven’t seen you smile like that in a long time,’” remembers Anthony. At points, they were even cautiously optimistic. Andrew was transferred to the Children’s Hospital Los Angeles and his first surgery came at the one-week mark, typical for a baby born with HLHS. However, during that surgery, the doctors found something atypical— hypoplastic right lung syndrome, or an underdevelopment of the right lung. On their own, neither HLHS or hypoplastic right lung syndrome is definitively detrimental; combined, however, they present long odds of recovery. With only half of a heart, the lungs need to be strong, and vice versa. Anthony and Kaitlyn stayed at the Ronald McDonald House near the hospital while Andrew was undergoing his many surgeries. It was a rollercoaster of emotions; he would seem to do well for a few days, and then something would go wrong. One morning, Kaitlyn was watching him in his room as he went into cardiac arrest and a code blue. It took 45 minutes of compressions and life support to keep him alive. During this time, Andrew was hooked up to a number of tubes running 24/7 to keep him alive; for a time, his heart could be seen through a hole in his chest, working as best as it could under a thin film of clear plastic. The life-saving medical equipment keeping him alive was also keeping his parents from holding him in their arms. One Sunday morning, the 2018 Los Angeles Marathon ran past the hospital on Hollywood Boulevard. Anthony and his son Noah went down to watch. Though he was only an occasional runner, something about the race inspired him. “I told my wife I was going to run the Los Angeles Marathon whether Andrew survived surgery, or whether he passed away,” says Anthony. At 5 weeks, Andrew’s health started to deteriorate. One of his valves was failing in the good side of his heart. The doctors performed a surgery to repair it, but after a week his heart took another bad turn. His heart was failing; it was simply working too hard to try and breathe. Soon after, the repaired valve began to fail again. This time, surgery wasn’t an option. Andrew was on a ventilator and his small body was enduring a medley of medications to keep his heart going, including fentanyl. After meeting with surgeons, cardiac doctors, and palliative care, the family made the heart-wrenching decision to remove treatment. After weaning him off slowly, they completely removed Andrew from his ventilator on Friday, May 18. It was the first time Kaitlyn was able to pick him up and look into his dark blue eyes since he was born. Medication allowed his heart to keep going for the next day, but his heart was working impossibly hard. His blood gas number (a measurement of oxygen to carbon dioxide in the blood) was 60 times higher than normal. On Saturday, they removed all medications but fentanyl to help him with the pain. On May 20, exactly two months after he was born, Andrew died in their arms. Anthony ended up taking off work for four months, using vacation, sick leave, and leave donations from many of his fellow officers. During that time, he never let go of his promise to run the 2019 Los Angeles Marathon. He started running a mile here and there, then eventually 3 miles at a time, and then a couple of half marathons. Shortly after Andrew passed, Anthony wanted to do something for the Children’s Hospital Los Angeles and raised a good amount of money just by selling bracelets. 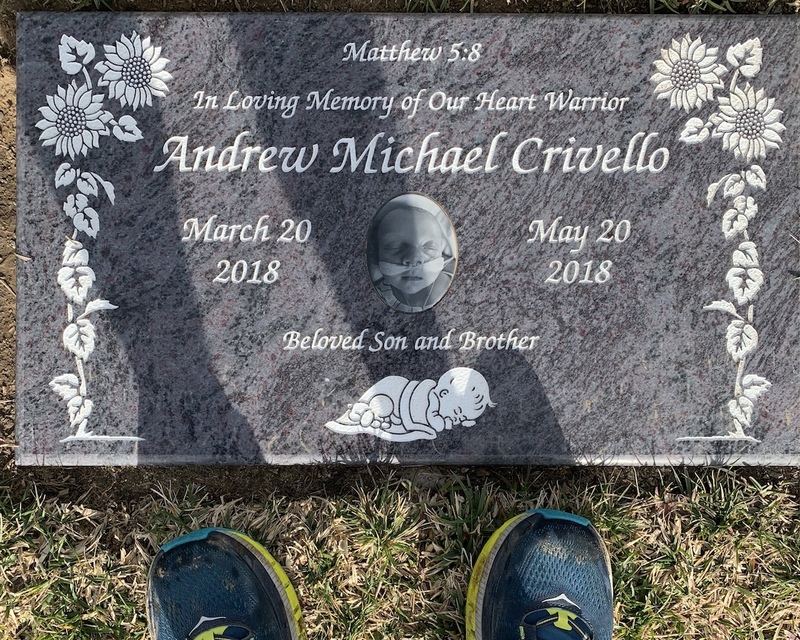 To him, running was a type of suffering— to remember Andrew, to carry the weight that he couldn’t, to breathe the air he never would. And as most runners know, his time on the roads became therapeutic. 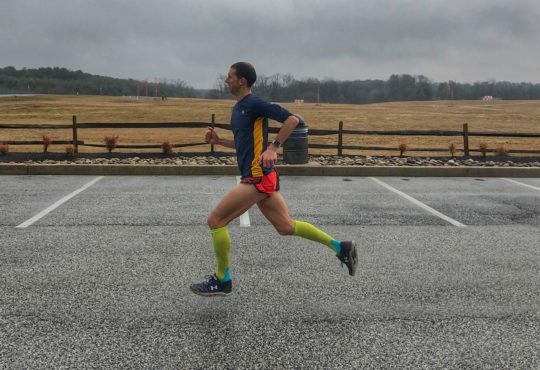 As he started accumulating more mileage, Anthony began to develop a way to raise money through his training, culminating with the marathon on March 24. He wasn’t big on social media but heard it was a good tool. Through Instagram especially, Anthony developed a good following and began posting a lot of his runs. CHD awareness month was in February, and he had the idea to do something for many of the families who follow him. Most of them either had or knew a loved one with a CHD. He got a huge response from around the country. Anthony adjusted his marathon training to fit in as many families as he could. He dedicated every run in February to someone with CHD and posted their picture and story on Instagram with the hashtag #StepsForCHD. 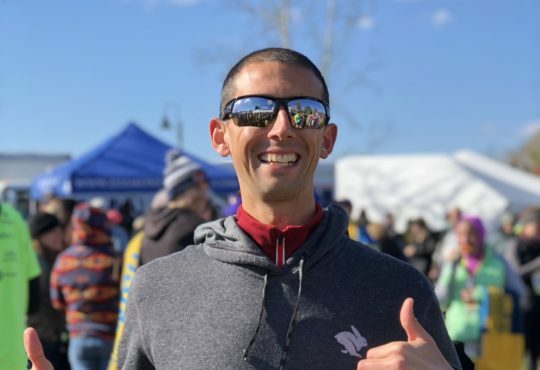 While drawing awareness to CHDs, Anthony is currently attempting to raise $5,000 through a Crowdrise page leading up to the Los Angeles Marathon. All proceeds will be given directly to the Children’s Hospital Los Angeles. On April 7, Anthony will also be fundraising for congenital heart defect research by participating in the Los Angeles Congenital Heart Walk, one of more than 20 Walks held nationwide by The Children’s Heart Foundation. The Congenital Heart Walk is the nation’s largest walk series 100% dedicated to funding the most promising CHD research to advance the diagnosis, treatment, and prevention of CHDs. This means that Andrew’s family and thousands of others can make a bigger and faster difference in critical CHD research funding. As the days toward Andrew’s first birthday draw nearer, the purpose of Anthony’s running takes on an even deeper meaning. Despite the weight, Anthony pushes forward, with life and with running. His heart and his lungs, pumping and breathing. There are many more breaths to take, many lives to change, and one life to remember. To join Andrew’s family in helping to rewrite the narrative for children born with CHDs, you can register to become a fundraising walker, team captain, or donor for the virtual walk, or a walk near you, at www.walkforchdresearch.org. To support the “Steps For Drew” Team and their fundraising efforts for the Los Angeles Congenital Heart Walk, you can donate or join their fundraising team here. To support Anthony’s fundraising efforts for the Children’s Hospital Los Angeles while training for his Los Angeles Marathon, you can donate here.